Some sort of auto-column-width adjustment would be nice. Atl-back-arrow, Alt+right-arrow, kind of does it. Search bar dropdown, kind of does it. Everything | Options |History, kind of does it. therube wrote: Atl-back-arrow, Alt+right-arrow, kind of does it. Didn't see the History setting before, nice. The Alt+Arrow key was kinda flaky though, as it doesn't seem to return me to the current search when navigating forward (perhaps it doesn't save the current search immediately or something). Opera (Presto version) also had an immensely useful typed addresses/search history. Especially handy for custom keyword searches (eg: y mad max trailer), something other browsers still lack. Arrow-key down, DEL (similar to what you can do with FF's awesomebar). therube wrote: Arrow-key down, DEL (similar to what you can do with FF's awesomebar). Thanks. Is this documented anywhere? Found the Search History page in the docs but it doesn't mention these features. Documentation wrote: How do I add a search to the search history? Press Enter from the search edit or perform an action on a result. This may explain why some queries aren't being saved when navigating foward/back in results - I haven't pressed Enter or performed any actions yet. Btw is there some RSS feed for the forum? It would be convenient for update notifications. Sorry for the double post, but I just noticed history drop-down entries aren't displayed from last typed. In fact I'm not sure what order they are arranged in at all. It's ordered by Search Count. Search Everything for 'Search History.csv" . therube wrote: It's ordered by Search Count. Ah, cheers. For me that's much less useful than chronological order like the Opera example above. Would be nice to have an option in the settings (or config ini) to alter this. When I examine multiple columns in Everything-1.3.4.686.x64, and find the datum I'm looking for in a column far separated from the Name column (usually it's the leftmost), then I want to immediately click on that datum and get the same results as if I had moved the cursor all the way left to the Name column and clicked there. Often I find I've skipped up or down a line or two and clicked the wrong Name line number. If this feature is already in Everything-1.3.4.686.x64, then please direct me to it. If not, when I see a commitment from "therube" (David Carpenter?) to implement this straight-forward feature, I will be more than happy to donate a fair shareware payment. 1) Implement the historical / chronological history described by specular. At least as an option; it's far more intuitive and customary. 2) I'd like to be able to set a font color for zero-length files. Actually I'd like to gray them out. 24213123.) allow keyboard shortcut for different views (thumbnail sizes, detail, etc) and previewer on/off. Arbie wrote: 1) Implement the historical / chronological history described by specular. At least as an option; it's far more intuitive and customary. Or at least, add an option to use the secure protocols. If the capacity to do so is there, I could not find it. I LOVE this Everything program! I recommend to all my Windows friends. This program is SO awesome and fast. I have saved countless hours of finding files - even though I have a strict policy of where to save my files. Hi, everything is great piece of sw.
is everything currently capable of such functionality? dupe: will find files with the same name. You've given me some ideas for a regex search over all the filenames, not just each single filename, making something like this possible. What I can't find (or is missing) is a way to specify a filter programmatically. In particular, I would like to open the program using specifically the (implicit) filter "All Files", without setting the default filter used when I open Everything later. Example: I have a Filter named NoLnkOrHist that I use almost exclusively and 'never' want to change permanently. I wrote a simple "ElseWhere.Cmd" (I made it available via "FileMenu Tools" on right click of any selected file). I would like to extend that Cmd so it finds that file using the filter "WithHistory" (that is, the predecessors) for just this call. I tried to do that via a bookmark, but I can not specify a filter "All Files" . I noticed searching for image by width or height is quite slow. Could it be possible to have an option to index those info ? If so it should be possible to enable indexing from IPC api. What would be the trade-off if enabling such an index? assume this come (very) close to finding duplicates? void wrote: The Everything.ini is automatically generated. Any changes made to the Everything.ini while Everything is running are lost when Everything exits. 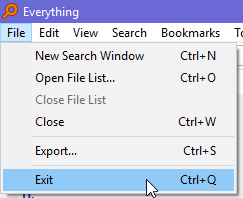 Please exit "Everything" before making changes to the Everything.ini file. Right click the Everything system tray icon and click Exit. Nice option to be done is menu command in File menu to reopen the Everything to avoid opening it manually after having it closed.